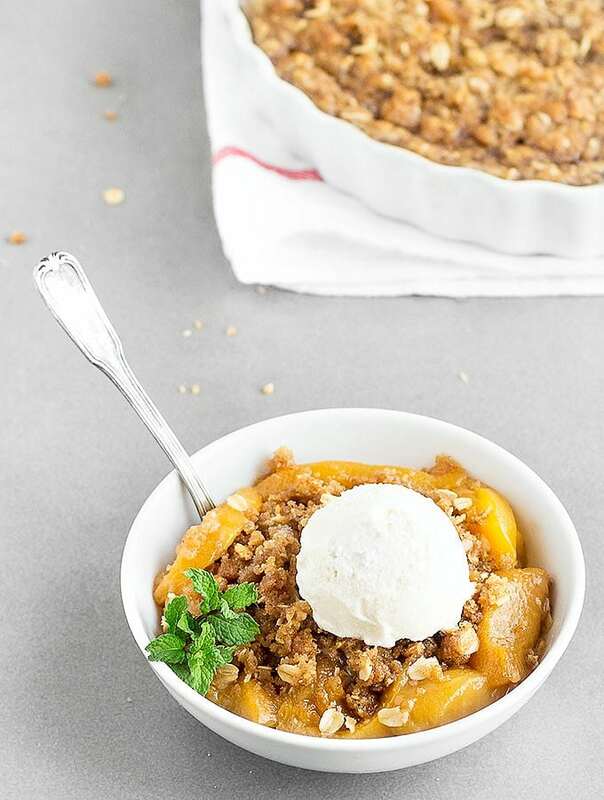 Coconut Oil Peach Crisp – Fresh, juicy peaches are topped with a crunchy oat streusel to create a crowd pleaser summer dessert. It’s perfect with a scoop of vanilla ice cream or a dollop of whipped cream. 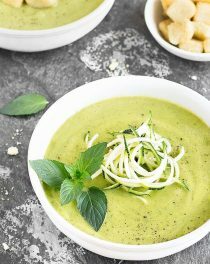 The recipe is easy and straightforward and can be thrown together in about 10 minutes. 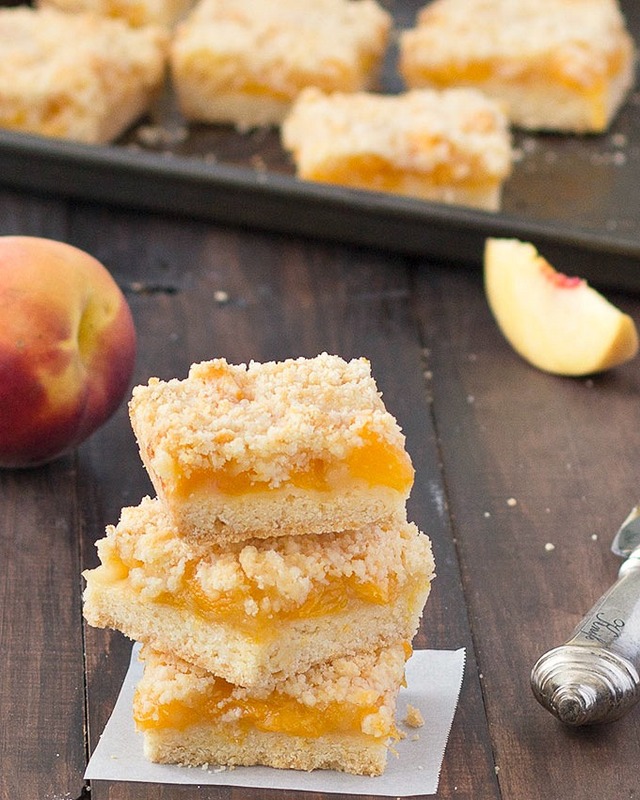 The filling consists of just 4 ingredients: sliced peaches, light brown sugar, vanilla extract, and all-purpose flour. The crumb topping is a mixture of old-fashioned oats, all-purpose flour, light brown sugar, cinnamon, and coconut oil. Simply transfer the filling to a baking dish, sprinkle the crumble evenly over the top, and bake until the juices are bubbling and the topping is golden. You can use fresh, frozen or canned peaches. If using frozen fruit, fully thaw, and drain any liquid before using. 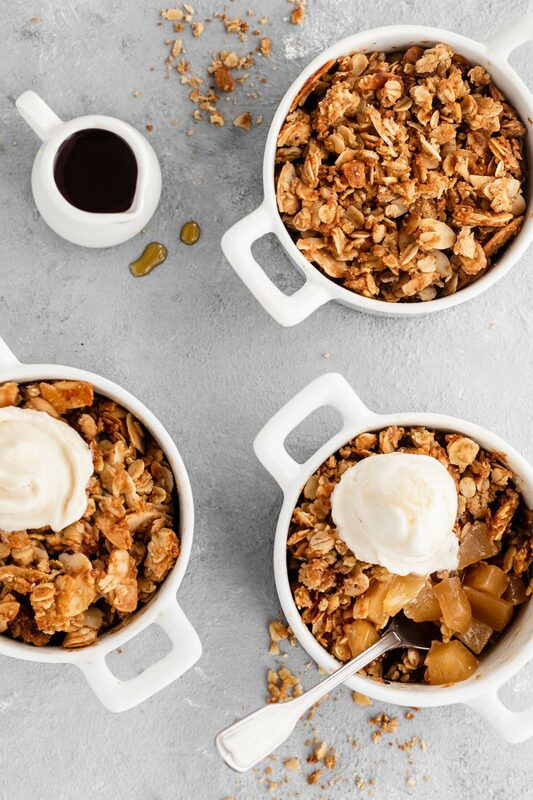 This peach crisp is totally versatile and you can prepare it with whatever fruit you prefer – pears, strawberries, mango, apricots, apples, blueberries, blackberries, or any combination. 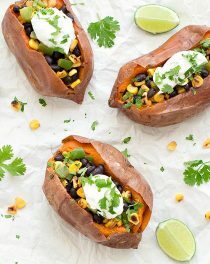 You can also throw in some chopped pecans or almonds to add a bit more crunch. Keep leftovers for 2-3 days covered in the refrigerator or freeze the baked peach crisp for up to 3 months. Serve this peachy crisp while it’s still warm from the oven with a nice scoop of vanilla bean ice cream on top! Enjoy! 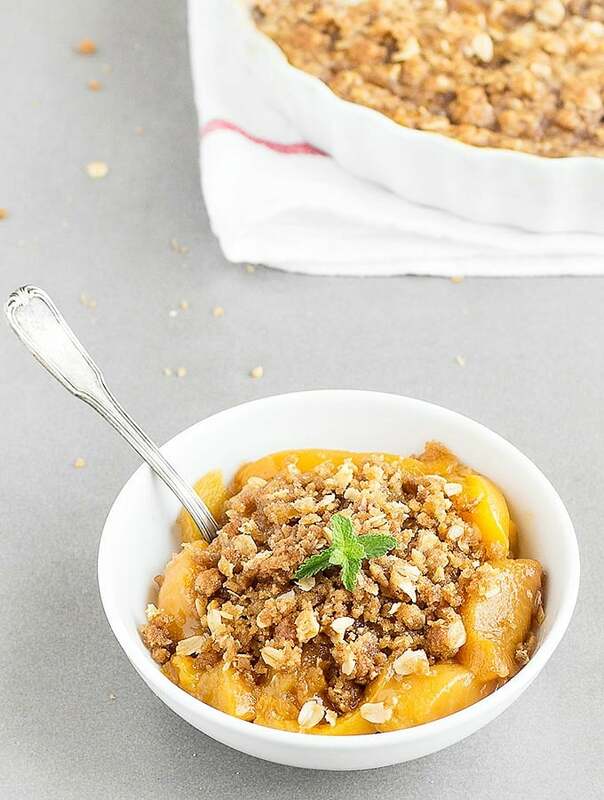 Coconut Oil Peach Crisp - Fresh, juicy peaches are topped with a crunchy oat streusel to create a crowd pleaser summer dessert. It’s perfect with a scoop of vanilla ice cream or a dollop of whipped cream. Preheat the oven to 175 degrees C (350 degrees F) and lightly grease an 8 inch / 20 cm (round or square) baking dish with coconut oil. Set aside. In a large bowl, gently toss the peaches with the flour, sugar and vanilla extract. Set aside. Place all the topping ingredients in a large bowl, and mix until everything is evenly distributed. Transfer the peach filling to the prepared baking dish, sprinkle the crumble over the top and bake for about 40-45 minutes or until the topping is golden brown and the fruit is bubbling. 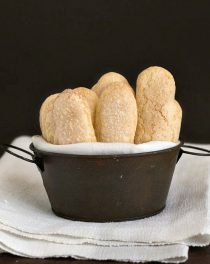 Remove from the oven, place on a wire rack, and allow to cool slightly before serving.